ALPHARETTA, GA – May 25, 2017 – The Rainmaker Group (Rainmaker) has successfully deployed its comprehensive suite of revenue management and business intelligence solutions at Westgate Las Vegas Resort & Casino (Westgate Las Vegas), a popular casino resort that is celebrated for its variety of suites, onsite amenities, customer service and prime location adjacent to the Las Vegas Convention Center. In late 2016, the Westgate Las Vegas team deployed Rainmaker’s guestrev®, grouprev® and revcaster® solutions to optimize property pricing and revenues, with grouprev® aiding the team in managing its impressive 200,000 square feet of meeting space. 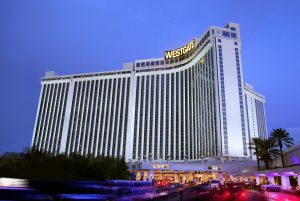 Since the implementation, the team at Westgate Las Vegas has seen a significant increase in YOY revenue, which is due in large part to the Rainmaker platform’s ability to provide a deeper understanding of demand by various customer segments. This highly granular insight is what allows property revenue managers to make the most informed, actionable decisions when optimizing profitability. The unique math and science-based algorithms of Rainmaker’s revenue optimization and intelligence platform exponentially boost profits for the properties using it, while providing revenue managers with a true understanding of overall demand by value-based customer segments. With the guestrev® solution, Westgate Las Vegas can now optimize room pricing based not only on room revenue, but on the total value of the guest, processing data from multiple sources to forecast demand and set room rates. Rainmaker’s grouprev® solution provides the necessary tools to maximize revenues from group business, helping revenue managers to navigate the complex and intricate data required for assessing group requests and driving conversion rates. Additionally, the revcaster® rate shopping solution provides deep insight into varying rates, shopping multiple channels to see what’s happening locally, so that hoteliers can monitor parity, maximize ADR and drive higher profits.